Join Orlando Chamber Choir for an all-day summer workshop at the National Musician’s Church, directed by James Weeks. The repertoire is based on William Byrd’s magnificent Great Service, written around 1590 when the Anglican style was still in its infancy. 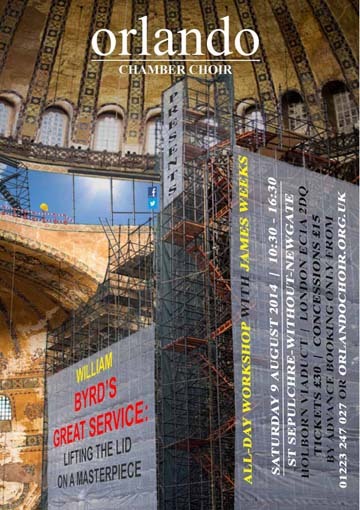 The workshop explores how Byrd uses the various voice parts to maximum effect, constantly changing the scoring and creating exciting variations in musical colour and tonality. The Great Service is contrasted with a number of smaller songs, psalms and anthems from the programme below. All choral singers are welcome but pre-booking is essential and good sight-reading skills are a prerequisite. The ticket price includes scores, interval drinks and cake.